Wintry Reflection, by Mike Jackobo. 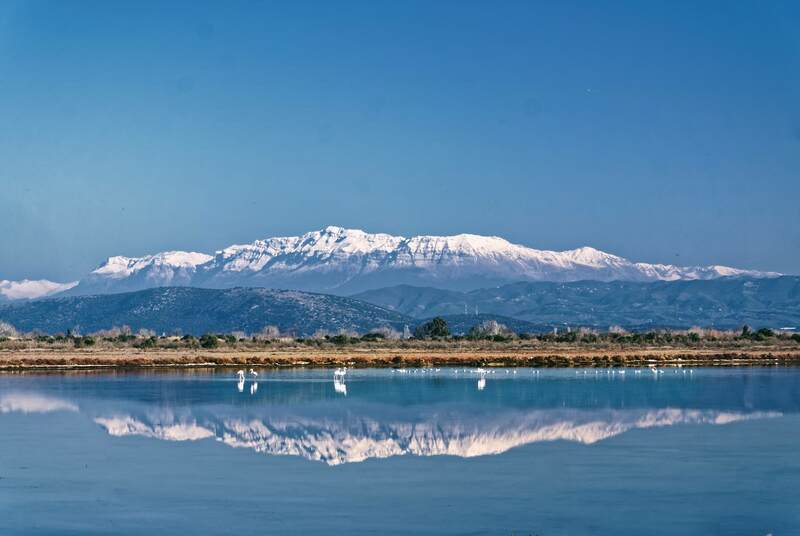 The water of the lagoon reflects the snowy peaks of the Tzoumerka mountain range; a wintry reflection! There are also Flamingos and Egrets in the water of the lagoon. Once again I return to Northern Amvrakikos Gulf. I have written in the past about the lagoons of northern Amvrakikos. This year I also visited it in the winter. I don’t know if it was the case in past years but this winter there were a lot of flamingos in the area. Therefore, with every chance I had, I visited the area trying to record those magnificent birds with my camera. Of course, the fact that my planned subject were the flamingos, didn’t mean that I didn’t took notice of other possible photo opportunities. That particular day was ideal for any kind of photography. Bright sun, no wind and a clear atmosphere. This combination equals, of course, excellent visibility. Therefore, the Tzoumerka mountain range, also known as Athamanika mountains, which are about 45km away, are perfectly visible. The snowy peaks break the dominance of the blue sky and make for an impressive scenery. The perfectly still waters create an excellent reflection that creates an even more impressive photograph. In the end of the day though, I had to create a composite photo in order to get the ideal result. Most of the image is the photo that had the ideal framing for the mountains. The only thing I didn’t like was the way the birds were captured in this frame. Everything was a mishmash that didn’t make much sense. I also made another shot that had the Flamingos and the Egrets in this, better arrangement but the framing was a bit tighter and not as impressive. So, I decided to combine the two images in order to have both the excellent wintry reflection and the good snap of the birds. Although I cheated a bit, I didn’t really change anything in what the photo wants to present, therefore I deem it worthy to present it here.